Ha! I'm with Kori on this one!! Little Catholic girl sluts. I went to a pizza joint a few weeks ago to pick up dinner. As I was walking back to my truck, I about walked on a used condom. Seriously? In front of a pizza place!? Get a room, or even backseat peeps!! Don't give up on Twitter just yet. You can meet lots of awesome people. I'm kandjplus5, or I have a link on my blog. The best thing I've found that works is to protect your tweets and you won't have a lot of random and slutty people following you. Gidget is totally adorable, but looks like she's saying "WTF Mom??" And please have Mr. Ski send lessons to my dh. He could use 'em! How cute is that dog!?!!!! Adorable! Hahaha@ the Golf/Goth story. You dodged a bullet with that one! Put a link to Twitter on your page if you want to make it public- I'll follow anyone I know, lol. Your dog's costume is sublime. I have to show my sister! Thanks for stopping by! Wasn't that red door amazing? Your dog is just too cute. Snow White! Golf vs Goth, that is a hoot. Plaid is the new black! Thanks for all the Birthday wishes...you all are so sweet! Gidget is cute but she's also a little diva and refuses to listen. But I guess she's good practice if we ever do decide to have kids! Oh my gosh... GOLF, not GOTH! HAHAHAHA!!!! 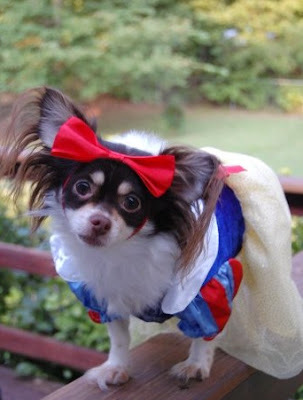 Your little dog's costume is adorable - and hilarious (all at the same time)! Gross - stupid spiders are everywhere right now. I usually just step on them though. It would have been hysterical if someone had shown up all goth'ed out! I'm cracking up just imagining it! The condom thing...yuck. I would have had a hissy fit. Your dog is so cute...and I'm not even fond of little dogs lol. Twitter takes a while. I thought it was stupid for the longest time...now I really enjoy it! It just isn't for some people though lol. I think I just fell in love with Gidget. Don't let her eat any apples. Gidget is a cutie! She and my dog look about the same size, however Rigsby refuses to wear clothes. He goes nuts to try to get them off! I took the dog out Wed. night and saw two giant spiders on the patio. Started to spray them and the reason they were so huge is b/c they were covered in their BABIES!! like a gazillion of them! eek! Happy early birthday. So sorry that you are having to have it alone. I can not tell you how excited I was to find out Man O Mine's R&R time fell around my birthday! Honestly, I'm not sure which is odder...a Goth them or a Golf theme. Guess I'm out of the loop...I don't know that I've been to any that where themed. That costume is so cute!!!!! Glad you got the yummy pancakes and that there were no spiders in them :) GetinHerHead.com is kind of a fun site for keeping a wishlist for special occasion gift-giving. They'll even remind your husband to send you flowers for no reason, haha! Following you on Twitter now :) Let me know if you need any help. Oh, man! That shower story is hilarious. I had to laugh about the golf/goth thing *L* It is VERY lucky you didn't show up all gothed out. If you decide to give Twitter a little more time, look me up, I'm realworldmom (surprise!). Wow, I've never heard of someone having so much trouble attending a party! Hope it went well in spite of the craziness! Awesome fragments!! LOVE the costume...too cute!! Sorry about work...hope things get better. And the bachelorette party? Cracking up...don't know which is funnier...the thought of you showing up in goth or when you said "and then I vomited" after hearing her sizes...classic!! LMAO at Golf not Goth. Good thing you didn't dress up. And Gidget's costume is so cute. I'm gonna post my pups costumes soon. BTW my dogs hate me. Oh and what is your twitter link? Mine is on my blog.